Accommodation in Scarborough, North Yorkshire. Our 7 day weather forecast for Scarborough updated throughout the day, making it ideal for planning leisure activities, travel and events. Read more about our weather forecasts. On Monday 22nd April 2019 the sun will rise at 05:45 and will set at 20:17. It will be a mild day, with temperatures reaching around 18.9°C. Today is expected to be a dry day, with a very low chance of rain. It will be quite a breezy day, with a maximum expected wind speed of 24mph. On Tuesday 23rd April 2019 the sun will rise at 05:42 and will set at 20:19. It will be a mild day, with temperatures reaching around 13.6°C. Today is expected to be a dry day, with a very low chance of rain. It will be quite a breezy day, with a maximum expected wind speed of 29mph. On Wednesday 24th April 2019 the sun will rise at 05:40 and will set at 20:21. It will be a mild day, with temperatures reaching around 14.2°C. Today is expected to be a dry day, with a very low chance of rain. It will be quite a breezy day, with a maximum expected wind speed of 27mph. On Thursday 25th April 2019 the sun will rise at 05:38 and will set at 20:23. It will be a mild day, with temperatures reaching around 11.2°C. A light shower is possible, 1mm of rainfall is possible today. It could be quite a gusty day today, with a maximum expected wind speed of 43mph. On Friday 26th April 2019 the sun will rise at 05:36 and will set at 20:25. It will be a mild day, with temperatures reaching around 9.5°C. A light shower is possible, 2mm of rainfall is possible today. It could be quite a gusty day today, with a maximum expected wind speed of 40mph. On Saturday 27th April 2019 the sun will rise at 05:33 and will set at 20:27. It will be a mild day, with temperatures reaching around 10.6°C. A light shower is possible, 2mm of rainfall is possible today. It could be quite a gusty day today, with a maximum expected wind speed of 31mph. On Sunday 28th April 2019 the sun will rise at 05:31 and will set at 20:28. It will be a mild day, with temperatures reaching around 8.3°C. Today is expected to be a dry day, with a very low chance of rain. It will be quite a breezy day, with a maximum expected wind speed of 26mph. Our weather forecast for Scarborough is updated throughout the day and has been found to be very reliable for planning activities such as days out, leisure, travel, events, fishing, golf and gardening. 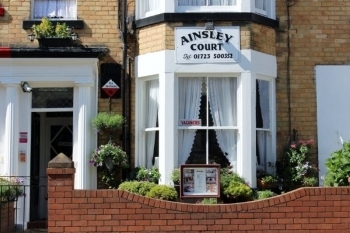 Based in the heart of the seaside town of Scarborough, Ainsley Court is a welcoming guest house providing a perfect base for exploring the Yorkshire coast and North York Moors. Whether you are staying for business or leisure. our guest house provides comfortable en-suite accommodation with a friendly atmosphere and delicious breakfasts served daily. Our stylish guest rooms offer the ideal home from home environment with rooms for individuals and couples. Our double and twin guest rooms are all en-suite and our single guest rooms have their own private bathroom. Superior twin and super king rooms enjoy views towards Oliver’s mount, Irton Moor and the North York Moors. Free Wi-Fi service is available for our guest's use. Situated only 5 minutes walk from the Town, Peasholm Park, open air Theater, beach and Scarborough Castle.